We started printing InMoov back in December 2016 and we've learned a lot along the way. 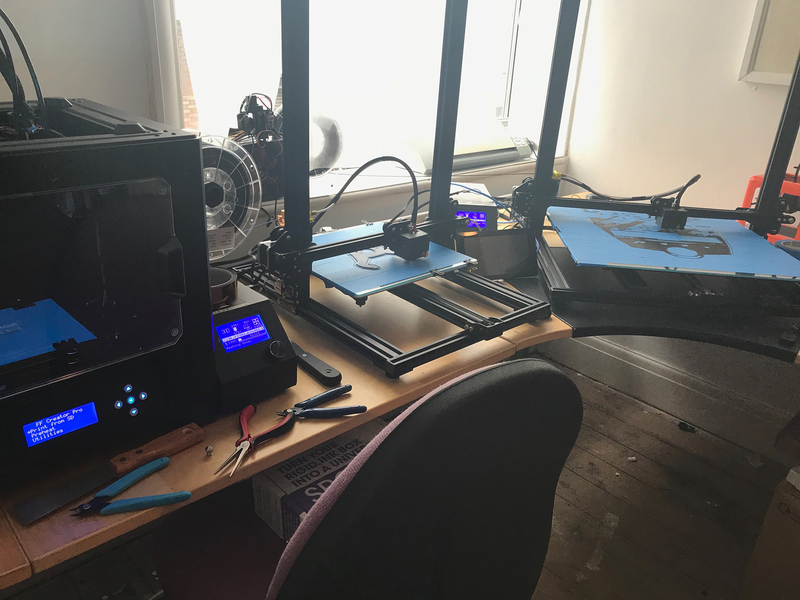 We began printing on our trusty FlashForge Creator Pro 2016 and quickly became frustrated by the 230 x 150 x 155mm build area but large format 3D printers were few and expensive. We started thinking about printing big! We planned to order a Prusa i3 mk2S but then the Creality CR10-3 came out and brought with it a 300 x 300 x 400mm build area at a very reasonable price. It was then that we started thinking about printing big! 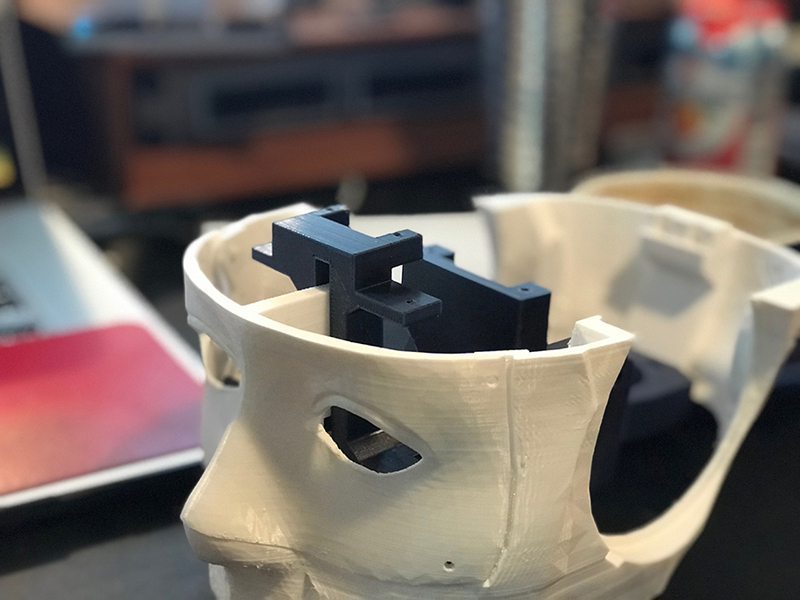 There are a number of InMoov modifications available that have joined the original parts to allow the printing of large parts on bigger printers. We even started our own modifications that were unavailable or didn't include changes that we needed. We realised that we could print almost anything at any size! We then picked up the new Creality CR10-S5 which offers a mammoth 500 x 500 x 500mm build area; it was the that we realised that we could print almost anything at any size! At this point we decided to reprint our InMoov robot using our new printers and incorporating more modifications from the InMoov community. We originally printed the structural and mechanical elements in black ABS and the aesthetic parts in white PLA but the black doesn't show much detail in some lights and we thought about switching to a new colour, we also decided to try other filaments as the Creality printers aren't that good at printing ABS parts due to having no enclosure. We did some test prints in PETG filament and was impressed by the quality and strength as well as the shine it produces. We've therefore decided to print our new InMoov entirely in PETG and are sticking with white for the aesthetic parts and using "shifting blue" for the structural and mechanical parts which looks beautiful. We may also print some of the mechanical parts in nylon on the FlashForge which is currently being upgraded (more on that soon). 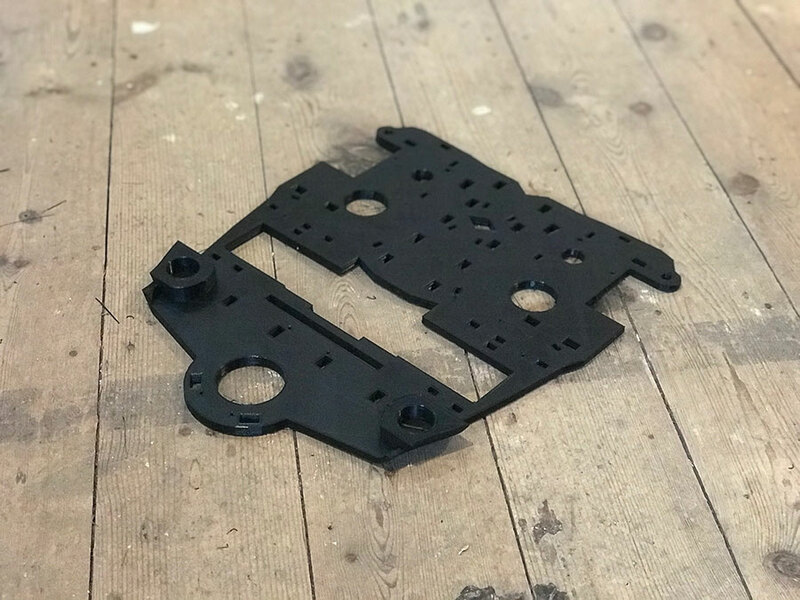 We've collated a number of ready made larger parts from the InMoov community as well as the modifications that we've chosen to incorporate into our robot. We've also been busy working on our own InMoov modifications and have created a GitHub repository to hold our current work. N.B. Any parts on the develop branch are subject to change, please wait for finished parts that will be released to the master branch and then Thingverse. We're still working on modifications and printing the parts we've collected as well as our own when they're finished. We have some big plans for our InMoov and have some exciting developments to share with you very soon!